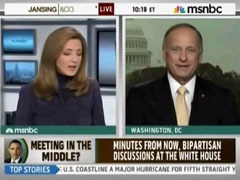 In the segment before she interviewed him, MSNBC anchor Chris Jansing labeled Rep. Steve King (R) of Iowa "one of the most radical right-wingers in Congress." Nothing was said of the comment in the interview, and her questions proceeded as normal. Following a debate on the extension of unemployment benefits, Jansing remarked that "up next we're going to talk to one of the most radical right-wingers in Congress and talk about what he plans to do when the GOP takes control of the House." In the next segment, she interviewed Rep. King. Jansing asked King about the DREAM Act, tax cuts, and compromising with Democrats. She pressed King on immigration and the DREAM Act, using an clip of an illegal immigrant student who said she wants "to give back to the country that saw us grow." "What do you say to a student like that?" Jansing asked King, who has been an opponent of the DREAM Act which provides a path to citizenship for illegal immigrants residing in the U.S.
"Doesn't America need well-educated workers? Should there be an opportunity for them to stay?" Jansing pressed the Iowa Republican. In the previous segment, Jansing lamented the uncertainty of extending unemployment benefits that expire Wednesday. "Two million people's lives at stake, what's the solution?" she asked. CHRIS JANSING: Up next we're going to talk to one of the most radical right-wingers in Congress and talk about what he plans to do when the GOP takes control of the House. UNDOCUMENTED IMMIGRANT: Many of us are not criminals. Many of us just want to show this country that we care, that we love it, and that we just want to give back to the country that saw us grow. JANSING: What do you say to a student like that, college graduate, has done very well, brought here as a little kid by their parents, no decision that they made, worked hard, got a good education, and wants to be productive – doesn't America need well-educated workers? Should there be an opportunity for them to stay?